Enrolling students provides them with an account they can use on their school machine or at home. With the account, students are given an activation code that they can use to associate their license with that of the classes. Downloading & Installing – Student, teacher, or lab install instructions. Log into http://store.gginteractive.com. Navigate to products. If you have purchased a site license, GG|Interactive will generate licenses at your request (typically one month prior to the start of school). Email education@gginteractive.com for additional licenses or problems. 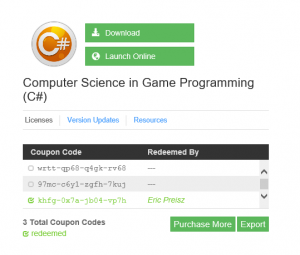 If you are using Game Design for free, you will need to generate coupon codes. Follow the instructions on the product page. Coupon codes are 16 digit alphanumeric codes intended to be shared with students. See the image below for an example of codes generated for a Computer Science in Game Programming (C#) course. Export or share the coupon codes with students. Direct the students to http://store.gginteractive.com/join-class where they will create an account and be asked for their coupon code. By joining a class, students will be guided through installation. If you or your IT will be provisioning student machines, you may use the teacher’s activation code on all machines. The activation code is located in your account under the product page in the “Installing DevPro” tab.